“It’s not often that I get all that excited about shiny objects, mostly because I never find any, but this week we have had a bumper crop, not all over site mind, just down in the deepest, wettest, muddiest hole, where a few of us have been banished to splash around excavating in a Roman Walbrook river management channel. Anyway, joke’s on the others because it turns out the Romans had a thing for leaning over the edge of the river and chucking coins in, so this week’s blog is about a couple we shovelled out of there and the enigmatic faces struck upon them. Obverse: Bust of Antonia, head bare, hair fastened in long plait at back. The value of a coin is not just in its metallic worth or its dating ability but they also give us a great insight into political issues of the day in which they were minted. Coins were struck and distributed throughout the empire, spreading propaganda direct from the emperor into the hands of his subjects. 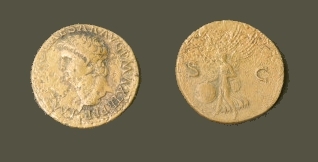 In this example the emperor Claudius struck a coin with an image of his mother Antonia on it to commemorate her life. A particular interesting character and story of political intrigue right at the heart of Rome. Antonia was a very well-connected woman, at the heart of the Roman ruling family for four emperors. She was the younger daughter of Marc Anthony and Octavior minor, niece of the emperor Augustus, sister in law of the emperor Tiberius, grandmother of the emperor Caligula and mother of the emperor Claudius. She reached the height of her power when her grandson Caligula became emperor in 37AD as his favoured advisor, but he slowly became dissatisfied with having his grandma tell him what to do and stopped listening to her advice. Worried she was losing control and power over the emperor she became increasingly paranoid and needy of his attention, eventually resulting in Caligula refusing to see her alone without his advisors. She was further alienated when Caligula, himself a paranoid old sort, had his cousin, and Antonia’s other grandson, Gemellus, beheaded to stop him inheriting the empire in Caligula’s place. Fearing that she was probably next on the hit list she committed suicide, though some say (who ‘says’ they’re long dead!) that he gave her the poison himself. Her son, Claudius, succeeded Caligula and he minted the coin in her honour to restore her reputation as a central political figure of Rome, and in turn reflecting her glory his own way as her son and rightful heir to her political prowess. On the coin she is called ‘Augusta’, a title Claudius gave her posthumously, the female version of the title inherited by emperors only, an honour only previously given to the wife of the emperor Augustus, Livia. He also declared a public holiday in her honour. This coin is of the emperor Nero, but unfortunately, I could not find any other known examples of this specific coin. The closest I got was one dated to 66AD, which fits within 20 years of the previous coin, so isn’t to bad a date, but that coin although having the same odd left facing emperor, had an alternative image of the winged victory and was minted in Lyon, France. He was forever desperate for people to like him and spent an awful lot of money minting coins to try and increase his popularity, covered in images and descriptions linking him with better emperors and shouting about any small victory he had, hence the reverse of this, and many other of his coins. The shield victory carries is Augustus ‘Clipeus Virtutis’ or shield of valour presented to Augustus seen on a whole lot of Nero’s coins. Romans in possession of the coin would recognise it as Augustus’s shield and the propaganda chaps back in Rome believed that they would subliminally link the popular emperor with his less than popular successor, reinforcing the tenuous position of the former. This coin is probably post the great 64AD fire of Rome and so Nero is in trouble, but he can still claim to be the legitimate heir of Augustus and cling onto power that way. These amazing coins, and others from the site, will now be sent back to the office to be cleaned, and looked at by our coin expert! Coin II looks like an as of Nero dating to the period AD 64-67. SC reverse type depicting Victory with shield. Mint of Lugdunum. See RIC I, p. 182, no. 544. Hi Philippa, thanks for the ID info! I will make sure the archaeologist that wrote the blog sees it, encouraging that he got it right! The MOLA coin specialist will look at all the coins and identify them, but always useful to have the information available at the time when the object is excavated! Glad that British Museum and PAS staff are enjoying our blog! Keep reading!